Even anglers who usually eschew high-tech fishing tools eventually give in and decide to get a fish finder. This shouldn’t be surprising; few things will improve your fishing success like a high-quality fish-finding sonar unit for your boat or kayak. These tools not only help you to find fish, but they allow you to see the world beneath your boat, which will also give you a better chance to outsmart your quarry. While super-high-end fish finders tend to get a lot of the attention, most anglers should start with an entry-level unit. This will allow you to learn the basics and start finding fish, without spending a fortune on unnecessary features that you aren’t yet ready to use. But this doesn’t mean buying the cheapest fish finder around – you need an affordable model that will work well. Anglers in this kind of situation are wise to check out the Garmin STRIKER 4 – one of the best fish finders available in its price class. While it lacks many of the features and advanced capabilities advanced anglers demand, it is perfect for anglers who want to start using a fish finder, so Fishing Tech grades it as a B. The Garmin STRIKER 4 is designed to be functional, yet affordable, so it comes equipped with only those features that most anglers will find helpful, rather than packing it with a lot of bells and whistles you are unlikely to use. Three of its features are especially valuable, and help the STRIKER 4 jump out ahead of the other fish finders in the same price class. The most important part of any fish finder is the sonar system it uses. Many budget-friendly fish finders use traditional transducers, which only emit sound waves at one frequency. This can provide some information about the world beneath the water, but these types of systems lack the clarity and image quality most anglers want. Fortunately, the Garmin STRIKER 4 uses CHIRP sonar technology to provide better resolution and image quality. CHIRP technology emits a range of different frequencies, rather than just one. This helps provide a much more detailed image, which will help you distinguish between rock piles and plants, for example, as well as bait fish schools and big fish, which often look the same on traditional sonar units. The Garmin STRIKER 4 includes a built-in GPS circuit that will not only tell you where you are on the water, but it can tell you your direction of travel and your speed as well. This will help you find underwater features like creek channels, points and ledges, and because you can mark these areas as waypoints, it will be easy to find them again later. The Garmin STRIKER 4 can also be used like a flasher, which is quite helpful when you are vertically fishing in deep water. With the flasher function engaged, you’ll be able to see the lake or river bottom, your bait or lure and any fish that swim by. This also makes the STRIKER 4 suitable for ice anglers (just be sure to opt for the optional portable bundle, to make it easier to carry with you on the ice). Maximum depth readings of 1,600 feet in freshwater and 750 feet in saltwater. HVGA color display with 480 x 320 screen resolution. The Garmin STRIKER 4 has a very nice 3.5-inch color screen that is crisp, bright and easy to see while fishing on a sunny day. It even gives you the ability to switch the background color of the display to provide maximum visibility in any conditions. It is very easy to operate the Garmin STRIKER 4, and you can learn to access most of the various features in only a few minutes. However, if you need help, the STRIKER 4 comes with both a quick-start guide and an in-depth manual to help you figure things out. The GPS unit contained in the STRIKER 4 is very accurate, which will help you find locations that have previously proved productive. Relatively few entry-level fish finders include a GPS module, and even fewer include one of such high quality. The STRIKER 4 comes with a very nice mounting bracket that is quite easy to install. You can also swivel or tile the display in just about any direction you like, to make it easier to see the sonar readout no matter where you are in the boat. The mounting bracket also has a quick release latch that allows you to quickly and easily remove the STRIKER 4 when you leave your boat. The STRIKER 4 has an excellent split-screen function, which allows you to view two different types of information simultaneously. For example, you could view the 77-kHz sonar image on one side of the screen and the 200-kHz sonar image on the other side. Alternatively, you could view a sonar image on one side and the GPS display on the other. The STRIKER 4 boasts an IPX7 water-resistance rating, which means it is not only built to withstand the occasional splashes that can occur when you are fishing, it can even survive being submerged to a depth of 1 meter for up to 30 minutes. This is a great feature to have in any fish finder, but it is especially nice for those who fish from a kayak or canoe, where tipping over is always a possibility. It is always wise to compare any fish finder you are considering with other models made by the same manufacturer, as well as a few made by other manufacturers. Some of the most applicable comparisons are examined below. The Garmin STRIKER 4 is the most affordable fish finder in the Garmin lineup, but they offer a few other models that cost a little more and provide more features. The STRIKER 4cv is almost twice as expensive as the STRIKER 4, and the biggest difference between them is that the STRIKER 4cv includes both a standard CHIRP sonar circuit as well as a ClearVu scanning sonar, which provides photo-quality images. 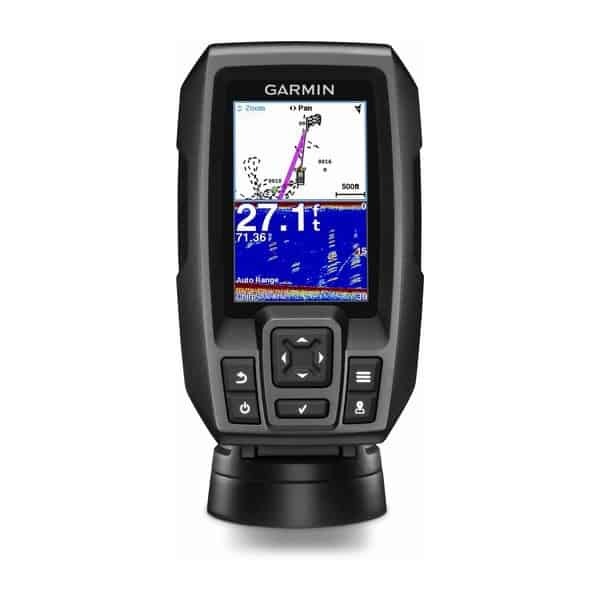 Most of the other fish finders in the Garmin line feature the ClearVu circuit and a larger display screen. Two of the best comparisons for the Garmin STRIKER 4 include the Lowrance HOOK-3x and the Humminbird PiranhaMAX 197c DI. Both are slightly more expensive than the Garmin STRIKER 4, but the difference in price is fairly negligible. Nevertheless, the Garmin STRIKER 4 is probably the best option of the three for most anglers, as it is the only one of the three that features CHIRP sonar and GPS functionality. The Humminbird fish finder has its share of fans, but many anglers found that it didn’t provide the kind of resolution modern anglers demand. The Lowrance unit does give you the ability to zoom in by a factor of four, and has the capability of tracking the bottom while you are traveling up to 55 miles per hour, but these characteristics would need to be very important to you to outweigh the Garmin unit’s included GPS circuit. See our Lowrance HOOK-3x Review. Very few fish finders in the same price range offer a similar level of quality and features as the STRIKER 4. The included GPS component is probably the most intriguing feature, and easily helps the STRIKER 4 stand out from its closest competitors. If you are looking for your first fish finder, or you’d just like to upgrade from the bargain-basement unit that’s already mounted on your boat, you’d have a hard time coming up with a better choice than the STRIKER 4.